Opposition to Patent Application No. 732973 in the name of NOKIA CORPORATION by QUALCOMM INC. TOPICS: Section 40 issues, clarity of claims. Claims found to lack fair basis. 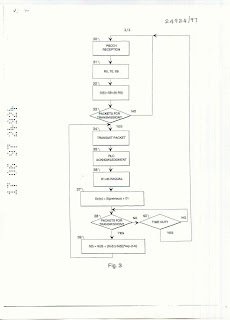 Nokia Mobile Phones Limited filed patent application 732973 on 17 June 1997 entitled "Control of Transmission Power in Wireless Packet Data Transfer". The application was accepted on 3 May 2001. On 3 August 2001, Qualcomm Inc filed a Notice of Opposition. The serving of evidence finally completed on 12 November 2004. According to the specification, the invention concerns a method for controlling the transmission power taking the special features of packet-switched links into account. The specification exemplifies the invention with the GSM (Global System for Mobile Communications) system. In such a system, the data transfer capacity to be reserved for one link is one traffic channel formed by one Time Division Multiple Access (TDMA) time slot being cyclically repeated in the transmission frequency and on the receiving frequency. In circuit switched data transfer, one problem is the sufficiency of radio frequencies. Data transfer in packet form has been developed as a solution. However, data transfer in such a form causes problems relating to the control of the transmission power. Claim 1 read as follows: "A method for controlling transmission power in a terminal device of a cellular radio system, the radio connection of which with a certain base station comprises an alternative first state (10) and second state (11), in the first state of which the terminal device receives (30) signals transmitted regularly by the base station and in the second state of which the terminal device additionally transmits (34) data as packets to the base station, characterized in that in said first state the control of the default value of the transmission power in said terminal device is based on measuring (31, 32) of the signals transmitted regularly by the base station, and in said second state the control of the transmission power in said terminal device is based both on the feedback transmitted by the base station on the quality of the data transfer link (35, 36, 37, 39) and on measuring of other signals transmitted regularly by the base station." The other independent claim, claim 13, read as follows: "A method for controlling the transmission power in a base station of a cellular radio system, the radio connection of which at least with one terminal device comprises an alternative first state (10) and second state (11), in the first state of which the base station transmits regularly control signals and in the second state of which the base station additionally transmits data as packets to a certain terminal device, characterized in that in said first state the default value of the transmission power in said base station is the same as the maximum transmission power of the base station and in said second state the control of the transmission power in said base station is based as well on the feedback of the quality of the data transfer link (35, 36, 37, 39) said feedback being transmitted by the terminal device, as on the time passed from the reception of the previous acknowledgment message by the base station from said terminal device." Qualcomm held that the claimed invention is not a manner of manufacture, is not novel, and does not involve an inventive step. Further, Qualcomm held that the specification did not describe the invention fully and the claims were not clear or fairly based on the matter described in the specification. For the purposes of this post, I will look at the clarity and fair basis issues. Much of the discussion at the hearing was related to whether the claims related to packet-switched or circuit-switched systems. Nokia asserted that the claims should be read in the context of the specification and of the published knowledge existing at the time of the application. Thus, they asserted that the common sense approach was that the claims referred to packet-switched connections. In response to this the Delegate of the Commissioner, citing Décor Corporation Pty Ltd v Dart Industries Inc, 13 IPR 385, commented that it seems impermissible to confine the claims to elements of the description if such elements are not expressly or by proper inference found in the claims themselves. The Delegate had a problem with the claims since they did not define the radio connection between the terminal devices. He set out that the claims were wholly silent in respect to whether the radio connection is packet-switched, circuit-switched or an overlay of one over the other. He again referred to the Decor case and stated that it was not legitimate to confine the scope of the claims by reference to packet-switched limitations that may be found in the specification. Evidence adduced by Nokia initially made much of the special features associated with packet-switched systems and that the specification inherently described such features. One of the witnesses set out that it was absurd to say that a circuit-switched radio connection can exist in alternative first and second states. The reason for this is that a circuit-switched radio connection is a continuous circuit which either exists or does not and so cannot exist in more than one state at a time. The converse is true of a packet-switched system. The Delegate held that there was nothing in the claims that clearly defines the operation of the two states. Due to the absence of this operational link, the Delegate held that it may even be interpreted that one or other state is optional since the word "alternative" does not mean the states alternate. The Delegate noted that the above independent claims were "notably silent" regarding any switching alternately between states. Thus, the Delegate regarded claims 1 and 13 as unclear. In considering the evidence of Nokia that the invention applied to packet-switched systems, the Delegate held that claims 1 and 13 were not fairly based on the specification since these features were absent from the claims. The Delegate raised a number of other issues, including a rather "startling submission" by the patent attorney for Nokia that an Applicant would not knowingly claim beyond the descriptive part of the specification or claim the prior art. In any event, this matter emphasizes the need for patent attorneys to ensure that the claims are both easy to understand and that the scope of the claims can readily be ascertained. The claims should be reviewed to ensure that the essential features of the claims correspond with features in the specification. It is clear that a thorough review of Nokia's specification by their Australian agents would have saved them a lot of trouble. This is a good lesson for us Australian practitioners.